Single-stage centrifugal pump consists of a body and an impeller which accelerates the liquid in the discharge pipe. Depending on the type of impeller (open, closed, or between the two) pure liquids or liquids containing particles can be pumped. Sometimes very large particles. These pumps consist of metal or plastic and are sealed with mechanical seal or gasket cord. Magnetic couplings are also very common. Usually these pumps are built to certain standards, but there are also specific manifacturer models, usually simpler and cheaper. 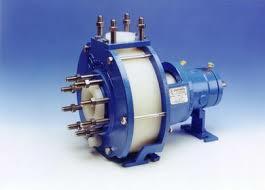 Also for the food and pharmaceutical industries, we have centrifugal pumps of JEC in our range. Pure, corrosive, abrasive, cold and hot liquid.